The recently concluded The Future of the Bengal Tiger, a conference hosted by the Sanctuary Asia, brought together over 150 delegates, speakers and other participants from all walks of life. Held on 6th August 2010 at the Teen Murti House auditorium, the participants were a blend of wildlife conservationist, researchers, media persons, bureaucrats, foresters and many school students and laypersons. Though students represented the majority, the blend of participants reflected the growing interest in tiger conservation among the general public. The conferences entailed talks by the forest department officials, military personnel, politicians, wildlife biologists and journalists. The sessions also dealt with issues like corruption, conflicting mandates among the different bureaucracies, political will towards conservation and other biological, social and political imperatives and challenges of tiger conservation in India. The entire discussion was holistically facilitated by the enchanting and forever enthusiastic Mr. Bittu Sahgal of Sanctuary Asia. 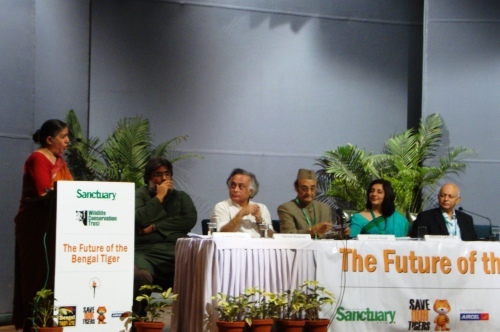 The inaugural session saw introductory speeches by some key people influencing tiger conservation in India. The Hon’ble Minister for Environment & Forests Shri Jairam Ramesh, Dr. Karan Singh, former chairperson of Tiger Task Force 1972 and a staunch conservationist began the day with their thought provoking facts and key challenges. Valmik Thapar’s stimulating talk drew attention of the audience and speakers to the grave situation of tigers in India. He spoke at length about bringing reforms in the selection, recruitment, training of the Indian Forest Service officials. He expressed concern towards the precarious state of forest department, staff and stressed on the need of good cadre-building through proper training, remuneration and strengthening them with facilities and arms to improve protection of the reserves. Other speakers in this session included Meera Sanyal RBS, Hemedra Kothari and Dr. Vandana Shiva. The second session was chaired by Ms. Belinda Wright of Wildlife Protection Society of India, Mr. P. K Sen, former director Project Tiger, Ms. Prerna Bindra, the renowned wildlife journalist, and Mr. Biswasjit Mohanty of Simlipal Tiger Reserve. The session included discussions on the protection status of Tiger Reserves, threats posed by poaching and left wing extremism to tiger habitats. Mr. Sen shed light on the inter-departmental conflicts between Indian Forest Service and Indian Administrative Service which is hampering tiger conservation presently. He recalled several instances when forested lands were mindlessly diverted to development projects and other activities by the revenue department that has led to the reduction of forest wealth in India. Ms. Bindra spoke about the rising wildlife crime and vulnerability of the protected areas to different kinds of criminal activities such as Naxalism, underworld, drugs and wildlife trade. The interactive session following the discussions was dominated by the questions raised by the students of various schools in the NCR. The students echoed their sentiments by asking the experts about what they can do to save tigers in India. The next session entailed insightful talks by three noted wildlife biologists of India Dr. Yadevendradev Jhala, who developed the new enhanced methodology All–India Tiger, Co-Predators and Prey Monitoring, AJT Johnsingh , Faculty at Wildlife Institute of India and Dr. Ravi Chellam, the world’s foremost expert on Asiatic Lion. Dr. Jhala started off his talk by explaining the biological requirements of tigers such as area, prey and sound habitat. He also highlighted the need to develop wildlife corridors to link various tiger landscapes to develop meta-population of tigers. Dr. Johnsingh spoke about the various plant species necessary for habitat improvement of the protected areas and how Protected Area (PA) Management should be made free from corruption. Dr. Chellam shed light on various biological and social problems of carnivore conservation in India. He suggested more careful assessment of source population of tigers be done in the tiger occupied landscapes. The final session involved an interaction between students, teachers and wildlife conservationists about what roles should students play to conserve the natural wealth of their country. Overall, the deliberations at the conference successfully sensitised participants to the spectrum of ecological, social, administrative, legal and political issues inherent in tiger conservation in India. The sessions also enabled them to recognise dilemmas and challenges of wildlife conservation in India and gave them an idea about how to address them in a more nuanced manner. The discussions were greatly enriched by the multidisciplinary gathering. However, one could perceive a distinct disadvantage in this diverse gathering especially for school kids and their teachers. The conference revealed a glaring lack of information and knowledge about wildlife conservation in the city-dwelling school students. Time for questions was used up by many participants to merely voice opinions or relate anecdotes that had almost no relation to tiger conservation. Consequently, very rarely could issues be settled by factual knowledge about the relevant science, policy or legal status of tiger conservation. This most of the discussions and queries remained on a general level. Editor’s Note: A.P. Jayanthi is founding-member Delhi Greens and has just finished her MPhil from Jawaharlal Nehru University (JNU) where she studied the debates over the methods used in monitoring tiger populations in India. Her study seeks to identify the processes, individuals and agencies involved in the generation, diffusion and reception of science in the field of wildlife conservation. The author is the Programme Coordinator at Delhi Greens. hiiiiiii good post thanxxx for the above information.